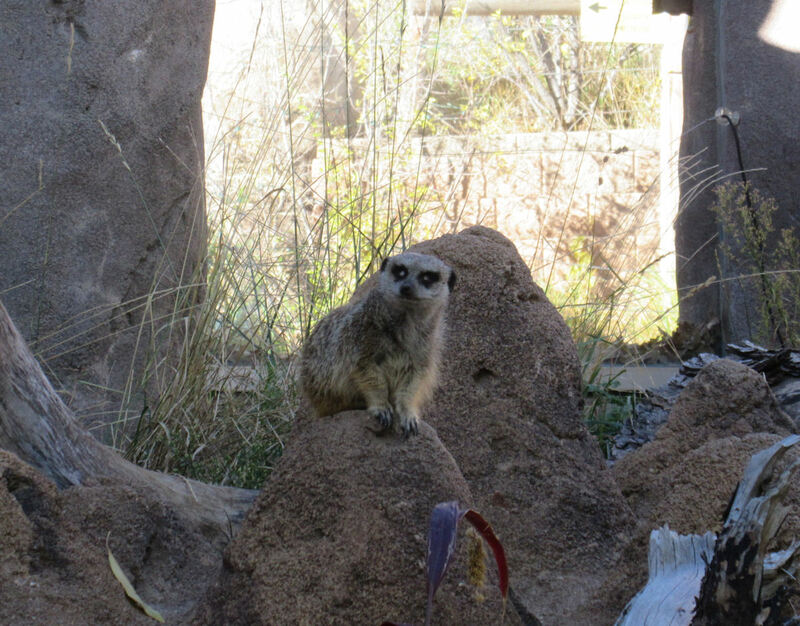 The Springs in Fall — 2015 Photos #11: Meerkat Man « Midlife Crisis Crossover! There I was, strolling around the Cheyenne Mountain Zoo, taking pics at my own pace while occasional crowds of preschoolers and home-schoolers enjoyed their field trips on a warm November morning. 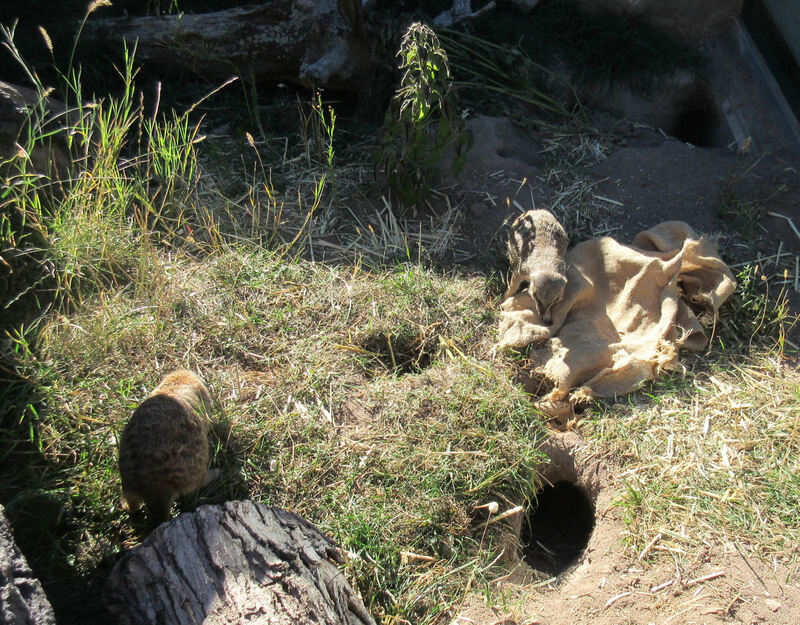 Before the zookeeper popped the question, I’d seen a couple of meerkats already along the path through the “Yellow Zone”, the designated turf for their African animals. You know how a lot of zoo animals are. A zoo is a wonderland whenever you get to see its residents acting up, prancing about, batting at their food, performing cool tricks, or just running laps around their pens. Too often, though, they hide on the far side away from the visitors’ windows, pretend they don’t see you, and schedule back-to-back naptimes from 9 a.m. to 7 p.m.
Other times, they refuse to do anything but stand perfectly still and gaze into your very soul. * I looked lonely and in need of cheering up. 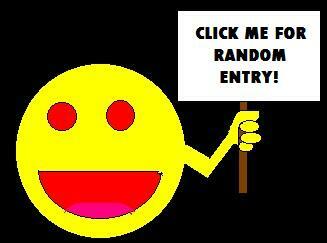 * They saw a weirdo scribbling into a notepad, suspected I was a blogger, and saw a promotional opportunity. * It was their way of keeping the creepy loner under closer surveillance. * I looked like I wouldn’t be scared of cuter, fancier ferrets. * I looked like I wouldn’t sue if they bit me. * The home-school moms had a vote and no one told me. * I was the very next person coming up the walkway at the exact moment of feeding time. 1. With burlap in one hand, apply small quantity of wriggly protein with the other. 2. Place infested burlap on ground. 3. 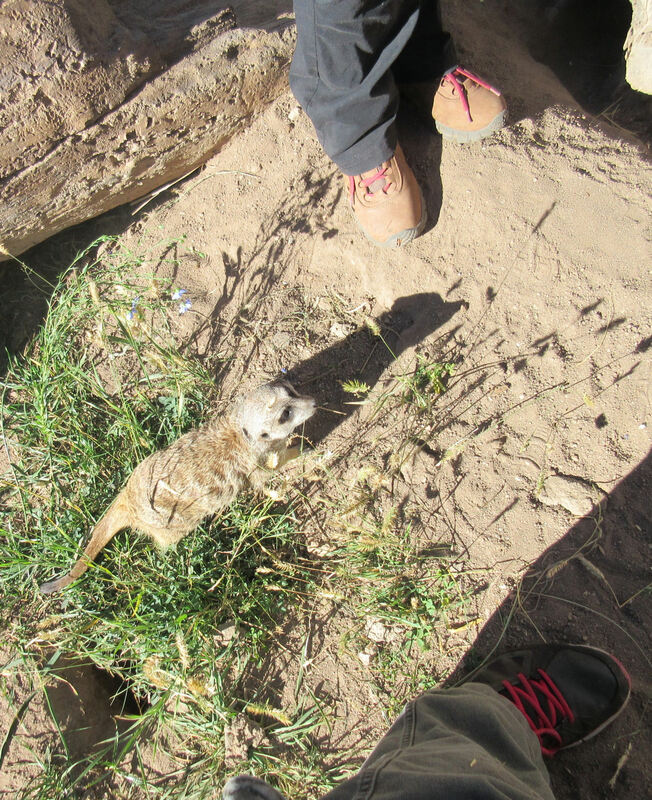 Back away a few inches; wait for meerkats to overcome fear of strangers. It didn’t take long for the furry li’l diners to evaluate me as a non-threat and emerge from hiding. Apparently they thought the grub(s) worth the risk. Once they were finished, they remained tentative and didn’t approach me too closely. They didn’t lick my hand, nuzzle against my leg, make happy meerkat noises, perform selections from The Lion King, or complain about their portrayal in Madagascar. 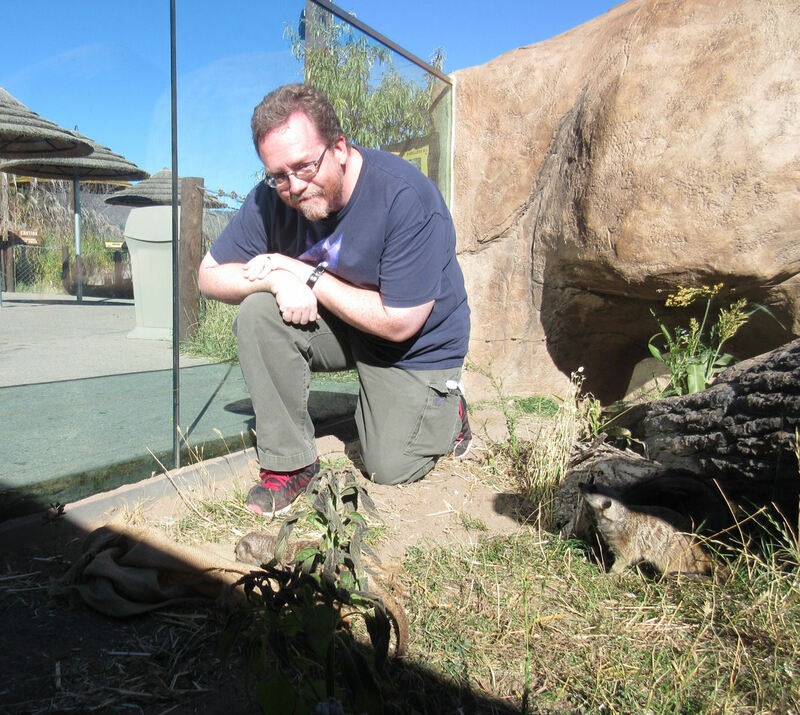 By the same token, the zookeeper’s invitation did not extend to me holding a meerkat, which is just as well because I understand their reaction would inflict several points of damage. And I like my eyes where they are. But I appreciated the chance to go backstage for a few minutes and hang out with such popular performers. A few kids wandered by during the meerkats’ meal, and I’m sure they were curious why one of the people on the other side of the glass was dressed funny. 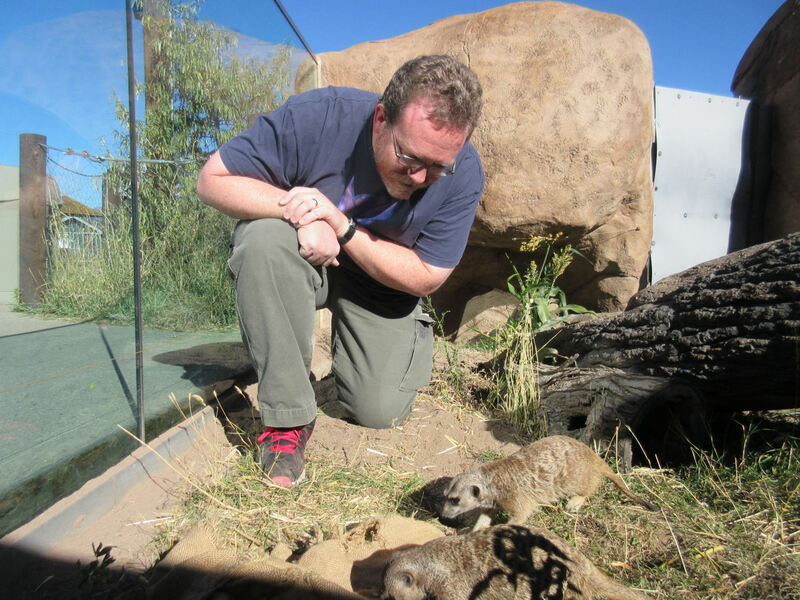 Relax, kids — maybe someday the mighty meerkat hivemind will choose you as their next servant. Where is the “AHHHH MEERKATS” button? I only see a like button here. My son has gotten to hold a few animals at past zoos, but I’ve always been the unlucky onlooker till now. It’s about time I had a turn! A giant cockroach would be, uh, different…not counting a few bad experiences in my old apartment. That’s so much fun, I hope you got photos of his animal encounters.